Soft drink behemoth Coca Cola is working with european payments specialist PingPing to incorporate NFC (Near Field Communication) into its vending machines, incorporating it into machines in Belgium and Luxembourg before the end of 2010. NFC is a short-range wireless technology that allows the exchange of data between devices. 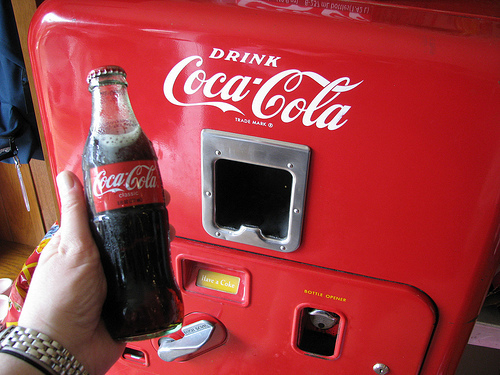 By outfitting its vending machines with the technology, Coca Cola will enable consumers to simply hold their NFC tag (currently a sticker on a mobile phone) in front of the the reader on the vending machine to make payment for their beverage. As Mobile Entertainment notes, the functionality could soon be built into the SIM card of a handset. Coca Cola’s announcement comes shortly after US mobile operators announced they would be combining to offer a wireless payment system for their customers. NFC is gradually starting to be adopted as the next generation in mobile payments, coming away from internet based transactions and ushering in a new contactless way to purchase. “After the success of contactless payment in the mobility field, this partnership with the major player in the beverage sector again demonstrates the soundness of our innovative strategy which aims to transform the mobile phone into an electronic wallet.